Revising Fiction: Is it Show? How can you Tell? You’ve heard it before: Never tell something you can show. This is a difficult concept for many new writers, but it’s crucial. 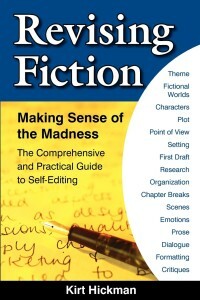 It lurks beneath a multitude of self editing sins: problems ranging from passive voice to information dumps and narrative summary, to absence of tension, and others. Telling the story, rather than showing it, gives it the detached feel of a news article. It keeps the reader from experiencing it as though she is the viewpoint character. It leeches the importance—the very life—out of the events. How do you know if you’re showing or telling? My rule of thumb is simple. Gerri was angry.In the first sentence, you see Gerri’s actions and are allowed to draw your own conclusion that she’s angry. This is show. In the second, I’ve drawn the conclusion for you. This is tell. Decide for yourself which is more compelling to read. Consider these examples from a critique submission.2 The scene is written from the viewpoint of a teenage boy. Tell: There was someone breaking into the house.Show: The trapdoor burst down and Ian jumped backwards. Dust showered the cardboard boxes that cluttered the closet floor. As soon as the ladder thunked down, a black boot stepped onto the top rung, followed by another.This example is the next sentence of the same submission. [Rhiannon] leaned forward, her eyes fixed on the artery that had begun to pulse faster as she leaned close to it.This is a great line. It shows the emotions of both characters. Rhiannon, whom you’ve surmised is a vampire, leans forward with her eyes fixed on Ian’s pulsing vein. It’s absolutely clear what she wants, and the author never said, “Rhiannon was hungry for blood.” Ian’s artery pulsing faster shows his fear without saying, “He was afraid,” or “He was excited.” Context will establish which emotion he’s actually feeling. Rewrite any sections in which you’ve told something. To find a way to show it, ask yourself this question: What can the viewpoint character see, hear, feel, smell, taste, or recall, that allows him to draw the conclusions that you’ve told instead of shown? In other words: How does he know this? If you’ve drawn a conclusion for the reader, the viewpoint character must also have drawn this conclusion. On what is his conclusion based? If the viewpoint character has nothing upon which to base the conclusion, no way to know the thing you’ve told, then the section of tell constitutes a viewpoint violation. Delete it or find some other place in your manuscript to reveal the information. Keep in mind, though, that if you move it, it’s still tell. You must still convert it to show. “Herrera was on board.”“On the Phoenix?” Chase said, surprised. “What was he doing there?”You may have shown the emotion well enough through the actions, thoughts, and dialog of the character. If you have, that’s good. If not, find a way to do so. Either way, delete the part of the tag that tells emotion. Below, I offer three ways to correct the passage above. I show Chase’s surprise through his actions, thoughts, and dialog, respectively. “On the Phoenix?” Chase glanced at the central hologram, as if it could somehow confirm the news. “What was he doing there?”“On the Phoenix?” He couldn’t be. “What was he doing there?“On the Phoenix?” Chase said. “What the hell was he doing there?”If finding ways to effectively show your characters’ emotions is difficult for you, you’re not alone. For help, read my series “13 Ways to Show Character Emotions” beginning with part one. 1Noah Lukeman. The First Five Pages. Simon & Schuster. 2000. 2Excerpts from critique submissions are reprinted with the permission of the original author. This article was originally published in the May 2008 issue of SouthWest Sage, and is reprinted here by permission of the author.